Meet your new favorite skin cleansing tool! 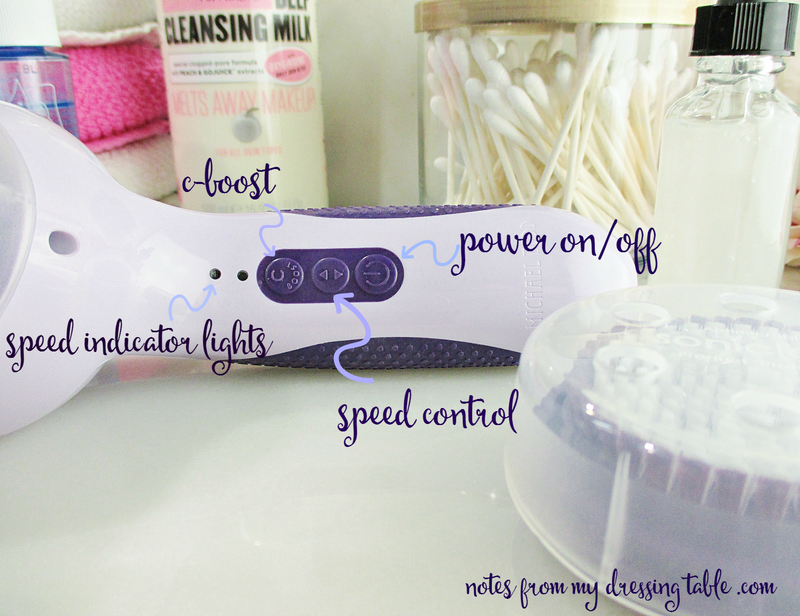 Once you've tried SONICLEAR you will not want to imagine your beauty routine without it! 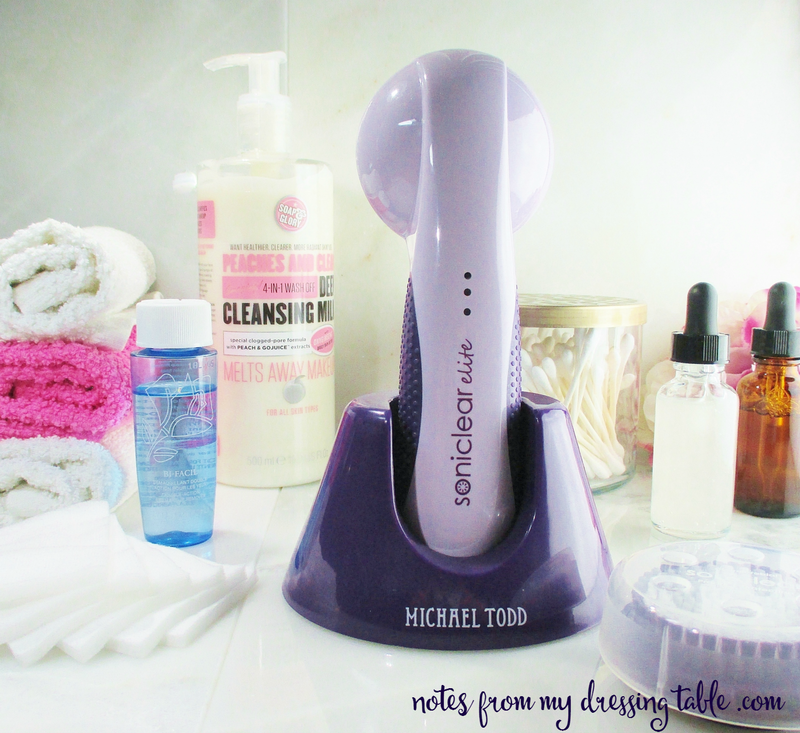 Michael Todd Soniclear Elite is the newest incarnation of the Michael Todd Soniclear, their stellar sonic cleansing brush. 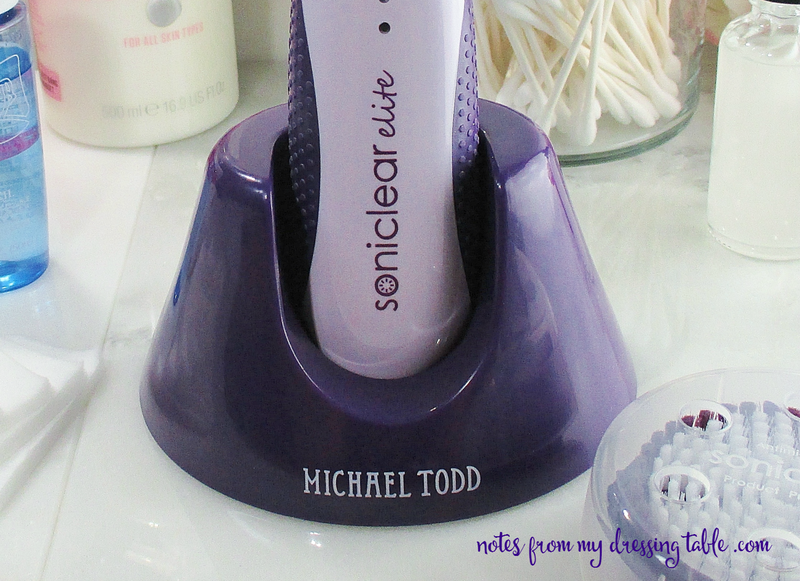 I was privileged to review it a while back and when I was offered the opportunity to try out and share my experience with the new Soniclear Elite in Lavender Lust I jumped. With it's built in LIFE antimicrobial product protection that helps keep the brushes stay cleaner, longer Soniclear is an industry first. Other traditional sonic cleansing systems don't provide this level of protection. Soniclear's advanced sonic wave technology cleanses the skin gently yet thoroughly with more than 18,000 micro-massage movements per minute, which offers six cleansing speeds and two operating modes letting you customize your cleansing experience to your skin's specific concerns. 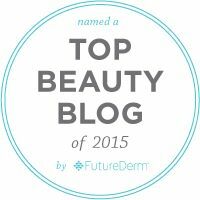 New to this model is Soniclear's C-Boost Collagen Technology. Another industry first, this special cycle massages and stimulates circulation increased rejuvenating benefits. Increased circulation brings nutrient blood to the skin's surface to help stimulate collagen and elastin production while flushing age accelerating toxins from the skin's surface. Soniclear Elite has set in it's handle soft touch buttons for easy control of power on/off and all functions. The unit is fully waterproof, you can safely use it in the shower or tub and there is no danger if you drop it in a sink full of water and reach in after it. Soft, rubberized hand grips make it easy to hold on to even with soapy hands. 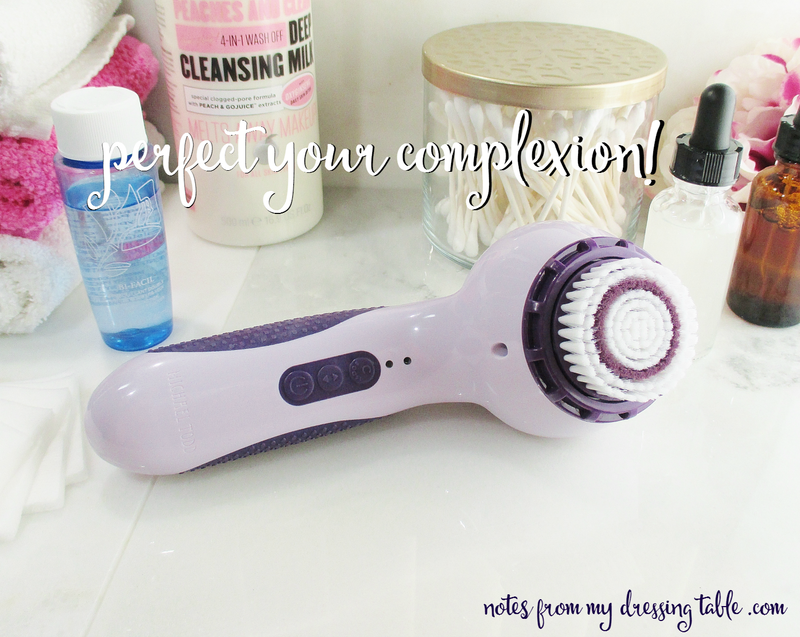 Soniclear Elite comes with a large body brush so that you can cleanse and pamper your body, just as you do your face! On the front of the Soniclear's handset are three soft touch buttons and two indicator lights. The bottom button is Power On/Off. The center button is Speed Control Up/Down. The top Button is the C-Boost Collagen massage cycle. The indicator lights tell you if you are rocking a high or low speed. 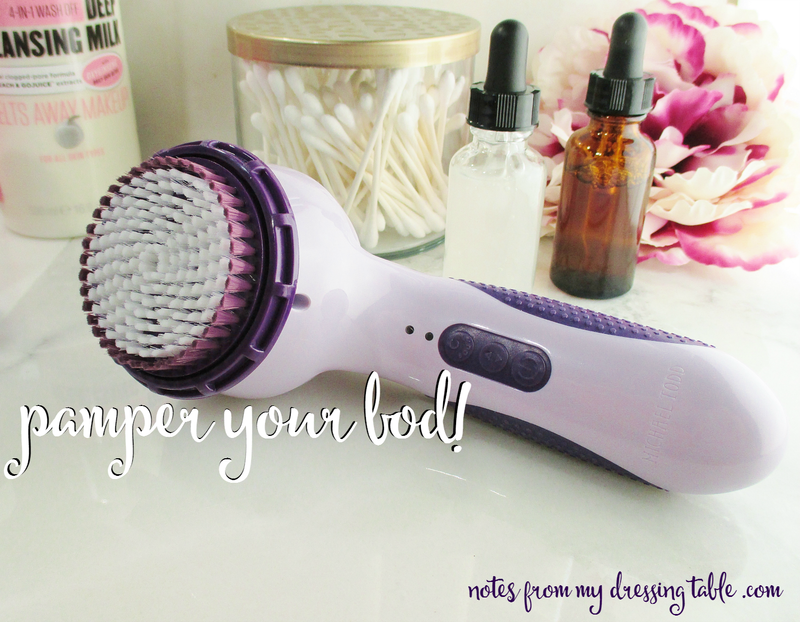 There are six speeds... Three for the face brush, three for the body brush. Yes, this little smarty knows the difference. Once you start your cleansing cycle, an automatic timer begins a countdown and beeps to tell you when it is time to move on to the next area of the face or body. The unit automatically shuts it's self off at the end of the cleansing cycle. If you want a longer cycle, just hit the power on, again and rock and roll. I like to go two cycles. I find three to be a bit much. When you first receive your Michael Todd Soniclear Elite you will unpack the nicely appointed box to find the handheld cleansing unit, the two antimicrobial cleansing brushes, a weighted charging cradle and a duel ended cord as well as an owner's manual. Before you use your Soniclear for the first time, it needs to charge for 24 hours. 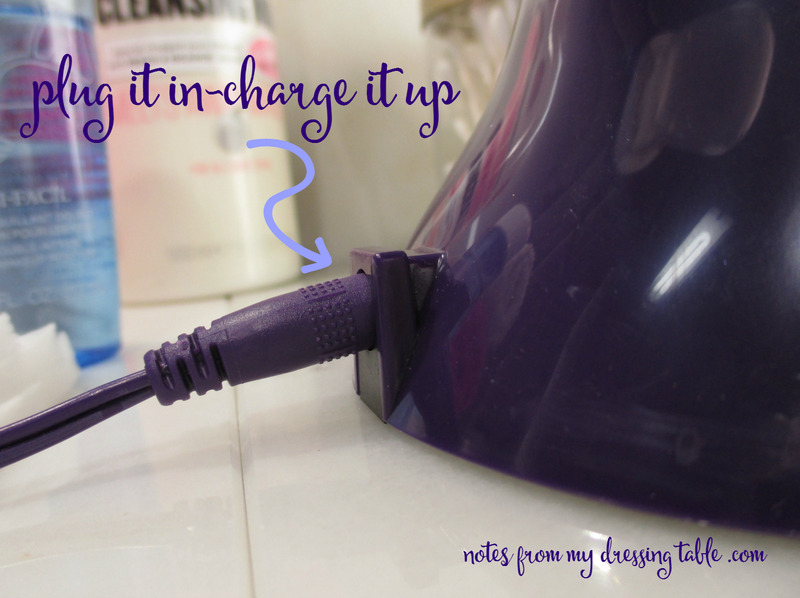 Plug the skinny end of the cord into the port in the back of the charging cradle and other end into a wall outlet. Set the Soniclear into the cradle straight down, with the brush head pointing away from you with the words Soniclear Elite visible in the U-Shaped dip. There are three indicator lights above the brand name on the handle, from bottom to top they will first blink, then shine steady then move up as the charge progresses. Once the top light shines steady, the Soniclear is fully charged. 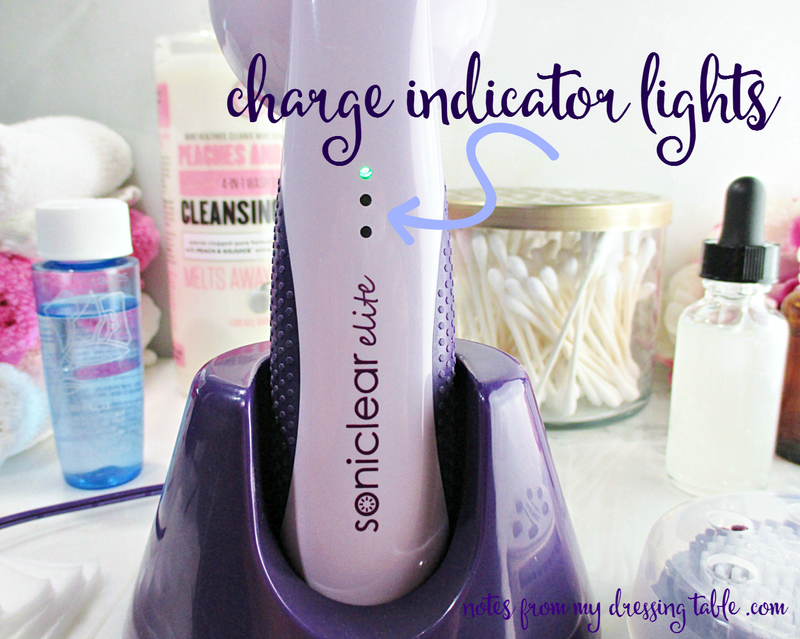 Remember, before you use your Soniclear Elite for the first time, charge it for the full 24 hours, even if the indicator lights glow fully charged before the time is up. Detail of where the cord plugs into the charging cradle. If you unplug the power cord from the wall, don't leave your Soniclear in the cradle, take it out or the charge will bleed out. Fully charged, your Soniclear Elite should run for about sixty minutes before needing it's next charge. Michael Todd Soniclear Elite arrives with two brushes, a smaller, softer, longer bristled face brush and a larger, shorter, firmer body brush. Both have Soniclear's LIFE antimicrobial built in protection. Care of these brushes is easy-peasy. I store my brushes with their plastic covers on to keep them dust and cat hair free. (Marley likes to "experience" my brushes. Little weirdo.) 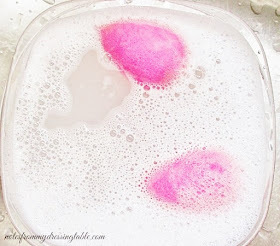 After I use my Soniclear, I rinse my brush, put a little dollop of liquid soap, suds it, rinse, click it off my hand set, spray it with a little alcohol (because I'm batty like that) and let it dry. Click it back on, put it's cover on and it's sparkling clean and ready to go when I want to use it, again. It sounds like a lot of raggle baggle but it actually only takes a moment. As with the original Soniclear, brush off/on is simple. Just push, twist, pull it is off. Then push, twist, click and it's ready to go. Replacement brushes may be purchased on the Michael Todd website: Face Brush and Body Brush. Replacement brushes are also available at Ulta Beauty, in store and on their website. 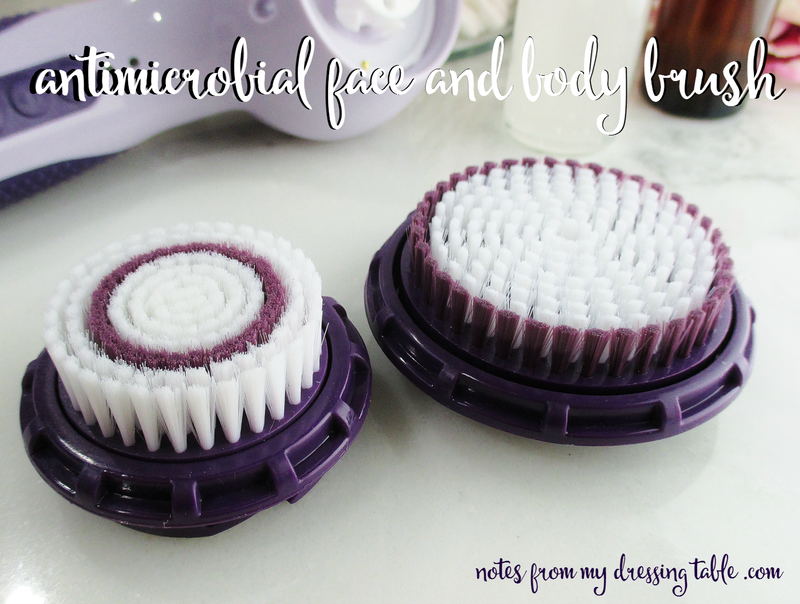 Face Brush and Body Brush. All brushes are $25.00 each. Just about any kind of cleanser is a-okay to go with the Soniclear Elite. I use foamy, non foamy, thick, thin, creamy, bar... I don't use it for anything grainy and scrubby. I like this skin care gadget. I like it a lot and I recommend it. It isn't inexpensive but the price isn't out of line and the benefits to your skin will make it well worth the investment. If you would like a Michael Todd Soniclear Elite Sonic Facial Cleansing System all your own, they are available in six fun colours and designs and the price is $149.00. Check out their skin care, too. What do you think? 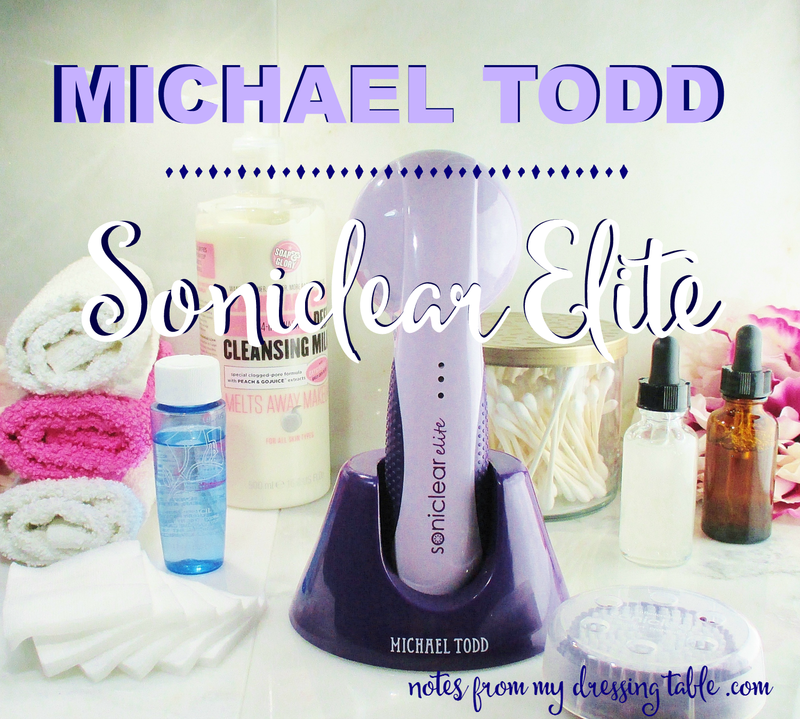 Have you tried the Michael Todd Soniclear Elite? Thinking about it? Tell me what's running through your gourd. Michael Todd is social, Visit on Facebook and follow on Twitter.